The Bapst Library, named for the first president of Boston College, served as the original Library from 1925 until the opening of the Thomas P. O'Neill Library in 1984. In 1993, Bapst was designated as the Art Library and continues to support the increasingly interdisciplinary teaching and research needs in the areas of Art, Architecture, Museum Studies, and Photography throughout the University and specifically for the Department of Art, Art History, and Film. The Bapst Library contains over 51,000 volumes, 150 serial titles, and access to hundreds of databases, electronic journals and books, and images in Art, Architecture, Museum Studies and Photography. The library maintains print and electronic reserves for courses in the Fine Arts. 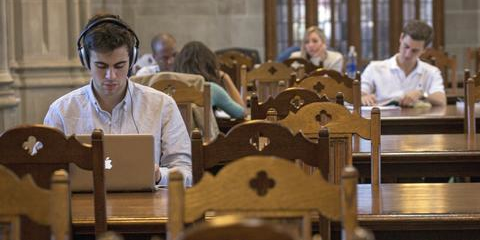 Bapst offers approximately 400 quiet study spaces in a combination of individual carrels and tables. The Kresge Reading Room houses print reference and over 150 periodicals, as well as individual study carrels. Computers with software and printing capabilities are available as is wireless connectivity throughout the building. Three scanners are also available near the computers and printers. The collection is housed on the lower level and in Gargan Hall. Tables and individual carrels are provided for study space. Gargan Hall on the second floor is open until midnight Sunday through Thursday for most of the semester and 24/7 during study days and finals. (2013) contains information about and maps of the stained-glass windows found throughout the Bapst building.